The title of this entry says it all for this one: Bacon.Bread. 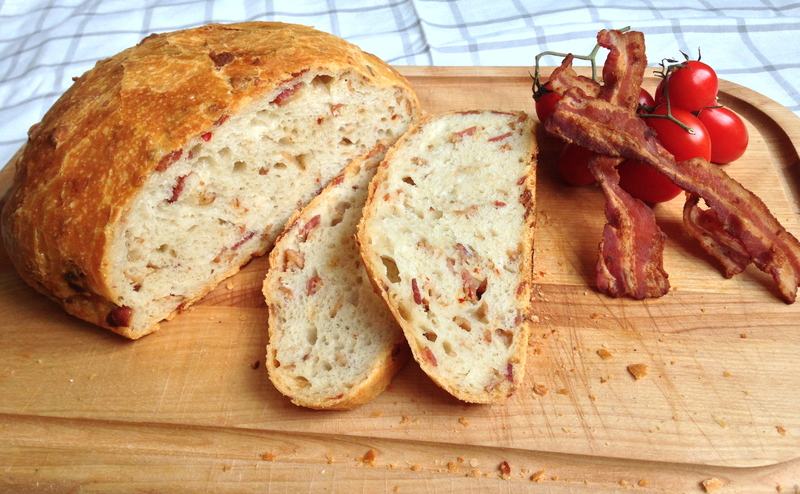 Delicious, fluffy bread with tons of bacon baked inside. Does it get any better? I really don’t think so. I’m pretty sure TheBetterHalf would be happy if this was the only bread I ever baked going forward. I mean what is not to love about three quarters of a pound of bacon being added to your bread dough? And imagine the sandwich possibilities with this loaf. A turkey sandwich…on bacon bread. A grilled cheese with tomato…on bacon bread. A BLT!….on bacon bread. What doesn’t sound better when you put it on bacon bread? I think even a PB&J would be phenomenal on this bread. I may or may not have tried that….TheBetterHalf was grossed out, but I thought it was amazing! The sweet and salty combo, mmmm….